Stop searching because you have found the guide to all of your Visa Questions. Most people will need a Visa to Vietnam, this guide will help you understand everything you might not know. The Visa process has been adjusted last year in order to encourage more travelers and tourists to come to Vietnam. This is great news for a lot of people but still not a perfect solution. With that being said, let’s talk about Vietnam Visa. who needs it? who doesn’t? how to get one?. 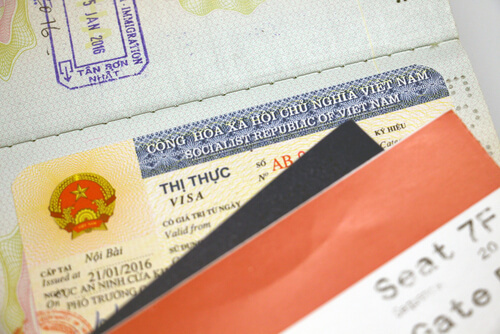 Requirements for everyone even if you don’t need a Vietnam Visa!? A passport! This might seem crazy to some people to even mention this but some might not be used to traveling. So lets cover it, you MUST HAVE a passport if you are visiting Vietnam from another country. This next point is very important and I have actually seen many people get caught up on this and not even realize it until they get here. Our company Back of the Bike Tours have actually seen this issue a few times where one person in a group gets stopped from traveling because of this issue. Don’t let it happen to you! Check cousin Jimmy and Grandma’s passport to make sure they aren’t expiring 6 months from the date you land in Vietnam. This isn’t something you can get around as well, If you land in Vietnam with a passport that is expiring, they will not let you in. Your best and most unlikely scenario would be that your embassy would issue you an emergency passport to travel. The most likely thing to happen is that you will be on the next flight home after sitting in the airport for a number of hours. Will I need a Vietnam Visa? There are only 24 countries at the moment who are allowed to enter Vietnam without needing a Visa for a certain amount of time. My country doesn’t need a visa to visit Vietnam! How lucky is that? Hey! That is pretty lucky as most countries do require a visa! Congrats and we hope you enjoy your vacation. Please make sure you don’t plan your trip longer than your visa exemption lasts and you will be golden! If you plan on staying longer than the amount of time you are exempt then please continue to read on and learn more. My Country isn’t exempt from needing a Visa, Whats next? That’s okay! Maybe your country will be exempt next year! Let’s get you a Visa so that you can have fun traveling around this beautiful country. Mail your Passport to the Vietnam Embassy inside your country. They stamp a Vietnam Visa into your passport and send your passport back to you. E-Visa that allows you to enter Vietnam through 28 different points of Entrance. This would be the best option for those coming into Vietnam through Land or Sea. Let’s jump into each way to get your Vietnam Visa, the specifics on how to get it. The advantages and disadvantages of each one. Before the days of the internet and expecting everything within just a few minutes of our current culture, we all had to send our Passport to the embassy before taking off to Visit Vietnam. What do we need for a Visa from the Embassy or consulate? Each country has its own price and time frame to complete the Visa Process. Since there are so many different countries world wide we believe you should use the following link to track down the embassy in your country and follow their Visa Process which should be rather easy and simple to follow. 01 application form to be completed online at http://visa.mofa.gov.vn ; please select VIETNAM EMBASSY IN THE UNITED STATES OF AMERICA as Place of visa submission and collection. After completing the online application form, please PRINT OUT and sign your application. In case you are unable to fill out the online application form, you can download the form (click here) and fill it out by hand or use paper application forms available at the Embassy upon your submission. Passport (the original for a sticker-visa application OR a copy of the ID page for a loose-leaf visa application) with at least 06 months of validity prior to the proposed date of entry into Viet Nam to meet airlines’ and immigration requirements). For Vietnamese holding a US Permanent Resident Card (also referred to as “Green Card”), you can apply for a Visa Exemption Certificate (click here), also known as “Viet Nam 5-year visa”. Visa fees: paid in cash or Visa Card/Master Card for in-person application at the Embassy, or in the form of money order/ cashier’s check/company check payable to “EMBASSY OF VIET NAM”. If you wish to receive your passport and/or visa sent back to your mailing address by mail: 01 prepaid self-addressed return envelope. To ensure safe delivery of your application package and visa, it is recommended that you use certified mail service offered by USPS, UPS and FedEx with tracking number to check on delivery status. The Embassy shall not be responsible for any loss of documents due to insecure and uncertified mailing service. In case you do not bring along a prepaid return envelope upon submission of visa application at the Embassy, you may use FedEx envelopes available at the Embassy and are required to pay for the additional mailing service. The process above seems rather straightforward. What is the Pro’s and Con’s of getting your Visa from the Consulate/Embassy? If you are worried about submitting for your Vietnam Visa on arrival through a scam site, then bypass those worries and just apply directly with the embassy. When planning travel and on the actual date of flying, sometimes thinks can feel rushed and overwhelmed. If you get your visa through the consulate/embassy its done and there will be no surprises when you land in Vietnam. This peace of mind is comforting and a huge reason to get your visa through the consulate. Many of the consulates/embassies provide an online payment source for you to pay for your Visa before sending your Passport to them for the Visa. Some people enjoy this rather then having to worry about cash payments on arrival in Vietnam. 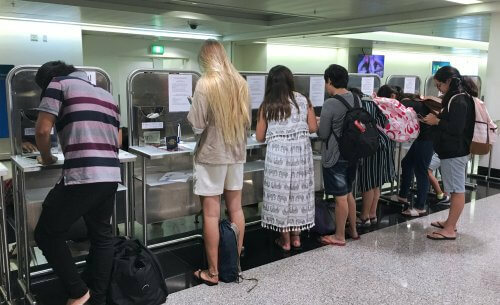 If you have your Visa already, you will queue up in the immigration line and not have to wait for the “Visa on Arrival” line that can sometimes add over an hour to the immigration process depending on how long the wait is when you arrive. After a long flight, I do find this additional line irritating. Getting a Visa from your embassy/consulate provides the option for you to apply for single or multiple entry Vietnam Visa and 1 month or 3 months Vietnam Visa. If you don’t have the luck of living right next to an embassy or consulate, you will have to send your Passport in via the post. This might take up to 6 weeks to get your passport back. If you are great at planning and do this part early, then time may not be a factor that you’ll need to worry about. Depending on your individual consulate, this might turn out being the most expensive way to get your visa. But the peace of mind might be worth it. This feels like a bit of a con because I don’t write many checks or get money orders in the days of debit/credit cards. This may not be a big deal for those who often deal with these forms of payments. Verdict: If I was traveling with just myself or as a couple. I might go for the option of getting my visa on arrival or Evisa listed below. If I was traveling with children or any sort of large group whether its all friends or family, I would prefer to gather all the passports and send them in for a Visa before the trip just for the knowledge that I won’t have any surprises when I land. This is my personal opinion though, and please use all the information provided to find out what works best for you. What is Visa On Arrival and a Approval Letter? Okay, here is the deal with the Visa on Arrival. Step 1: You Fill out some information online and make a payment to receive a Approval Letter. This letter allows you to get a Visa when you land before you go through immigration. What are the Pro’s and Con’s for the Visa On Arrival? You can sign up for your approval letter rather quickly, and in just a few days receive the letter allowing you to travel to Vietnam and get your Visa. The Visa on Arrival might be a little bit cheaper than sending your Passports to the embassy or consulate in your home country. This does depend on each country individually as the price for the visa differs country to country. In Emergency cases you can get your Approval letter in just 4 hours. This does depend on the time and availability of the immigration office and the agency you are using for you letter. The Visa on Arrival does not require you to go out of your way when preparing for a trip to Vietnam. After receiving your Approval Letter via email, the only thing you need to do is fly to Vientam where you will get your visa right when you get off the plane. The Vietnam on Arrival provides the option for you to apply for single or multiple entry and 1 or 3 months. Warning from Department of Foreign Affairs and Trade of Australia: There has been an increase in the number of Australians applying online for a ‘visa on arrival’ approval letter. There have been reports of visa scams involving online Vietnamese visa applications. There have also been reports of applicants’ personal details being made public by online visa websites. As result, we recommend you apply for a Vietnamese visa directly from the nearest Embassy or Consulate of Vietnam. – The Consular Department of the Ministry of Foreign Affairs of Viet Nam has recently received many feedbacks from foreign nationals on the visa online service provided by above-mentioned websites. – We holds no responsibility for any visa application for Viet Nam provided by these services. Personally, I have had no issue using an online service, but it is important to be made aware that these services are not the Vietnamese Government so they do hold some risk when relying on them for your visa. I have marked time as a pro when it comes to getting the approval letter, but the time spent waiting for your stamp after a long flight can be excruciating. I have also waited for hours at the airport when friends and family were waiting to receive their Visa stamp before going into already long immigration lines. I believe the biggest con here is that if there were any issues in your Approval letter process, then you might have a difficult time on arrival that will not be a great way to start your vacation. The other issue here is that sometimes people forget, I have been caught at the Visa on Arrival window myself with no cash for the stamping fee. That was painful after a long flight. A different example, my friend forgot her photos to give to the VOA when she arrived so she had to take time to get new photos and pay for that. While not expensive, its just painful after a long flight and doesn’t provide a “I’m ready for vacation” mood. The Vietnam on Arrival ONLY applies to travelers coming into Vietnam through an International Airport in Vietnam. This leaves Land or Sea Arrivals needing a different way to get a visa like the Vietnam E-Visa. Verdict: Visa on Arrival is really useful if you are in a pinch and need a visa quickly. If that is the case, then that one pro outweighs all of the cons of the Vietnam Visa on Arrival. If you are planning your vacation in advance, then getting your visa before you arrive might be a better option. I am glad you asked! The Vietnam E-visa is an excellent step forward for Vietnam. Adapting their tourism policies and infrastructure to their customers needs is very important and we are so excited to see that happening last year with the introduction of Vietnam E-Visa. Any other site is not an E-Visa and is either a scam or just signing you up for the Visa on Arrival. Alright, Now that we have that cleared up let’s get into understanding what you’ll need for the E-Visa. You will need a photo of yourself that looks like this. Your face will need to be clear with a white or light colored background. The next thing you will need is a clear photo of your passport details that looks like this. Here are a few tips from struggles we have read about online. You might need to resize the photo so that it is smaller for upload if you are using a photo from your phone rather than scanning your passport and photo. This can easily done by opening Paint program and resizing the photo to a smaller size. Right click on the image file in the File Explorer, select Open With, Paint. Select main menu item Image, Stretch/Skew … Change the Horizontal and Vertical percentages to a percentage less than 100. Keep the percentages equal to preserve the aspect ratio. Select the main menu item File >> Save As to save the resized image. After you have all that, its a simple process of filling in and submitting the form. You will need to pay $25 for your Vietnam E-Visa which is Single Entry for 30 days which should cover most travelers coming to Vietnam. The E-Visa is the cheapest option out of all three. At $25 for a 30 day single entry this is a nice price compared to the charge by embassies and consulates. Its not such a far departure from the price for Vietnams Visa on Arrival but still cheaper. This is the only option for paying your full Visa fee with a credit or debit card. Receiving your Visa back in 3-5 days is great turn around for the complete Visa. You can use your E-Visa at every port of entry into Vietnam. After viewing the website and entry form, this is a simple process to get your visa. Once you have received your Visa with No Errors on it, you are 100% done, just go right through immigration when you get to Vietnam with no worries. Personally, this is my favorite part, I like knowing that things are complete and done with no hang ups. The current process doesn’t allow for travelers to select anything other than the 30 day single entry Vietnam Visa. If you need to leave and come back, you will need to have another Visa. Currently, you can only apply for 1 visa at a time on the website. This means a family of 4 will have to enter in 4 different forms and make 4 different payments on the government website for the Vietnam E-Visa. This is a bit painful for most of us, but might be worth it when considering the price. It seems that the website has some issues every now and again not letting people submit photos. These seems to be debugged rather quickly and sometimes are user errors but it travelers should still be aware. Some name Typos may occur on your visa, these issues can from from the user or the immigration office. Either one still causes an issue going through immigration if the name on your Visa doesn’t match your passport. Please check each name carefully. This wraps up most everything you would need to know when it comes to getting a Vietnam Visa. As you can see there are multiple options with multiple pro’s and con’s. If you have any more questions about traveling to Vietnam or the Visa Process, don’t hesitate to reach out to us at info@backofthebiketours.com. We would love to help!